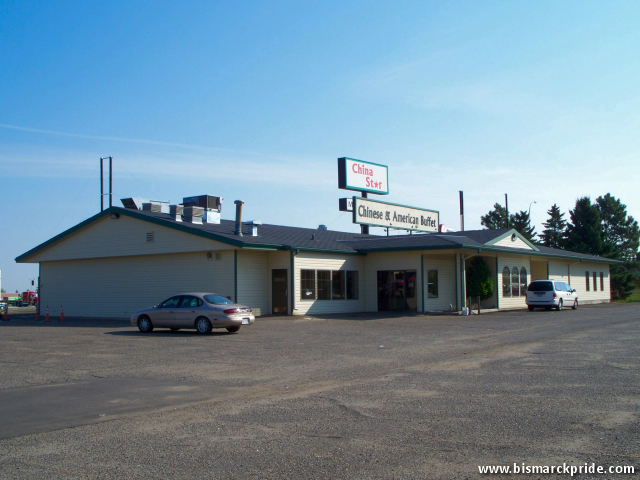 Located at 1065 E Interstate Ave near Gateway Mall in Bismarck, North Dakota. The building originally housed Caesar’s Centurion Family Restaurant, a cafeteria-style restaurant, from 1978-1984. Royal Fork, a long-time national buffet restaurant based out of Boise, Idaho, then operated in the building 1984-2004. Royal Fork was evidently founded by Jerry Caven in 1967 in Pocatello, Idaho. It eventually grew into a multinational operation that included locations in, at least, Alberta Canada and the states of Idaho, Washington, New Mexico, North Dakota, South Dakota, and Alaska. As 2017, Sioux Falls appears to be the only remaining Royal Fork.